The border really sets the stage on your quilt. What a wonderful imagination you have. Perfection. Kudos on a job well done. I really, really love your stars! 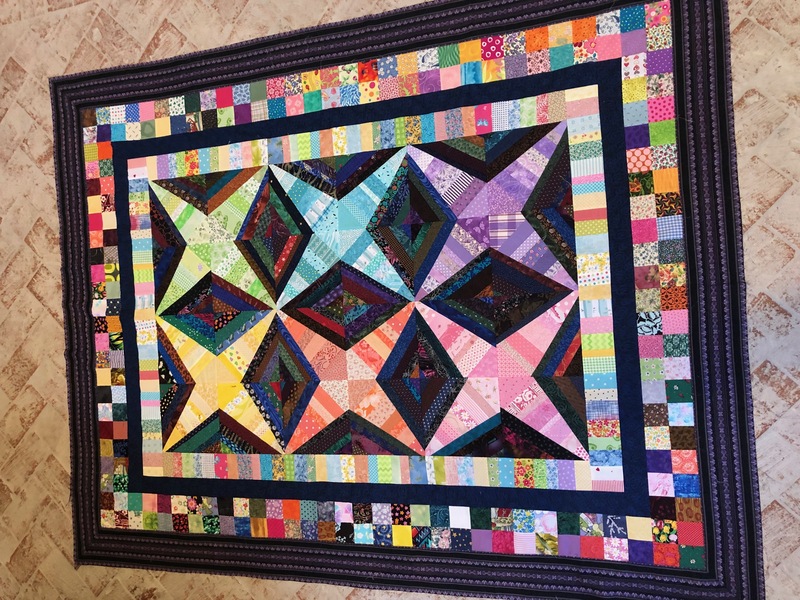 It's such a cheerful quilt! That is really pretty! Good job! I got tired of making the stars but needed to make it bigger, so just started adding to it. I had the 4 patches from previous leaders and enders, so that border was quick to make. And the last border (stripe fabric) was found in a bag of scraps meant for dog bed stuffing that was given to me ( I usually go through the scraps because as you see you never know what you might find ) and it was already cut to the size you see! just had to sew together into the lengths needed. Pretty lucky for that. this top measures about 56 x 70. Beautiful. I am a scrap quilter and YOUR quilt SINGS TO ME, very sweet songs. I love it! Great color ways in the stars and great borders. Very pretty! Great save on the fabric found in the doggy bed bag. I sometimes pull fabric out of my church's recycle bags too. Very pretty! I love the scrappy borders; they set the stars off perfectly, I think. And the stars are beautiful! Your scrappy stars are gorgeous! Love how you used all those other scraps for the borders. This is just super, super pretty! I dont know which is my favorite color, I think ALL of them ! Great job ! Beautiful! I love how you finished it. Love you quilt and makes me feel so good. Thanks for sharing. Wonderful coordination of color and design! I Really like it! And the finished is fabulous! Amazing - such great talent. 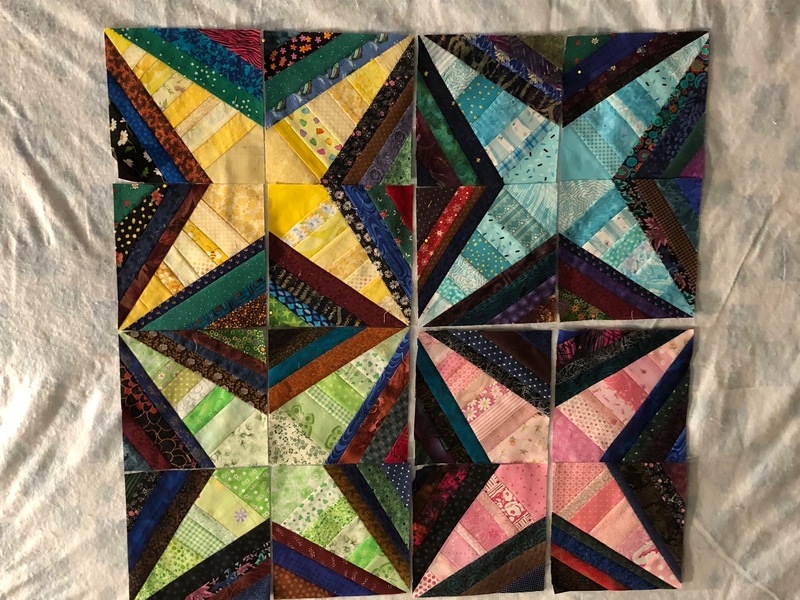 This is the nicest string star scrap quilt I have seen. Awesome. Very pretty, and colorful scrappy! Fun how everything came together for you. This is so pretty! All your borders are terrific, and what luck to get the stripe given to you. It makes for a really lovely, cohesive design.